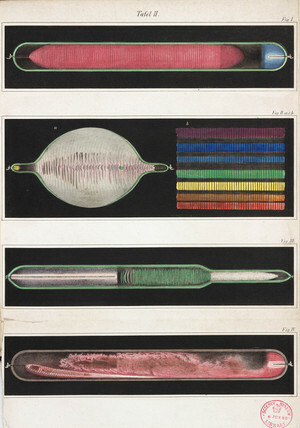 Illustration showing electric discharges through gases, from 'Beobachtungen uber das geschichtete electrische Licht' (Observations on the history of electric light) by W H Theodor Meyer, published in 1858. A high-voltage electric current is passed through a gas at a pressure much lower than that of the atmosphere, producing a fascinating glow as the gas is ionised. The tubes are named after Heinrich Geissler (1815-1879), a Bonn glassblower who devised a new pump that produced a much better vacuum than ever before. In 1855 Geissler used the pump to evacuate intricately shaped glass tubes in order to demonstrate this colourful electrical effect. Meyer also discuses the stratification of the discharges and the influence of magnetic fields.